Death Grips have been having quite the interesting year. They released the excellent album, The Money Store, back in April via Epic with plans to have another album out sometime this year. Then they cancelled their tour with no insight as to when they would reschedule those dates. And then, when Epic allegedly wouldn’t confirm a release date for their new album, NO LOVE DEEP WEB, until “next year sometime,” the group released it themselves by posting it for free on their website. 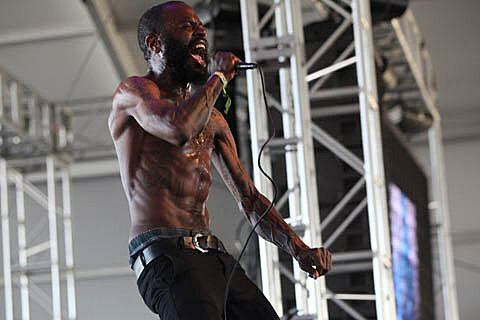 Their website was soon shut down, which Death Grips told PItchfork was done by their label, but which the label denied. There’s since been much speculation as to whether this whole Death Grips vs Epic battle is legitimate or a publicity stunt. Regardless, the website is now back up, and you can stream the album below or download it above for free. You can also view the NSFW cover art below, which Death Grips posted with the message, “U.S law states you must be 18 years of age to view graphic sexual material. We consider this art.” The album’s lyrics are at the website too. You can also make money off of the new album. In the wake of the NO LOVE DEEP WEB release, the band have finally announced a new tour! The tour comes to Chicago on November 20 at Bottom Lounge. Tickets for that show go on sale Friday (10/5) at noon. A list of all tour dates, the album stream and cover art are below.